Two SuperData Research related posts in one week? Well, we got the 2018 in review report before they showed up with the December numbers. But do the December numbers fill in any gaps left in the annual report? On the PC side of the chart League of Legends and Dungeon Fighter Online remain in the top two positions. However, Fortnite managed to bounce its way up one spot, into third position, passing Crossfire by, which dropped to fourth. Battlefield V disappeared off the chart, but as a title that series tends to be one that spike quickly and then fades. But speaking of things that disappeared, Fantasy Westward Journey Online II, long a staple of the list, went missing on the November chart but returned for December, taking that fifth spot. As I said last month, it had been rolling around between fourth and sixth for quite a stretch, so for it to go away for November and then reappear in that range in December raises questions. Did somebody just forget to send in the numbers? Likewise, World of Warcraft, another resident of the chart since it took on its current form, also went missing in November only to reappear in December. And, even more odd, we’re back to the “West” designation for it, something that . Does that mean that the game is strong here but tanking in Asia? Or are we seeing the results of Blizzard being cagey about what they report? The East/West thing first showed up in the report for January 2017. It was a surprise at the time. Then for the February 2017 report it was combined again, though the report was revised after it was initially published. The split returned again for the April 2017 report, then was dropped until this month’s report. Again, having dealt with this sort of thing in another industry, I suspect that SuperData has to deal with the data that Blizzard, probably via Activision, gives them. But why they should want to split the data is unclear. Maybe the “East” data wasn’t ready yet and they wanted to make sure they didn’t miss another month on the chart? Who knows. I certainly don’t. And, as I have said before, I wouldn’t bet money on any single chart’s data. It is the trend over time that interests me more. If WoW sticks on the chart in 2019 it might be okay to discount the disappearance in November. Anyway, lacking a crystal ball I will just carry on. In between Fantasy Westward Journey Online II and World of Warcraft sits PlayerUnknown’s Battlegrounds, holding its six place spot for another month. At eight position is The Sims 4, down a spot from last month, but still very strong for the title. Holiday sales must have been nice for it. World of Tanks hung in there at ninth position, down one. And then, in tenth place, there was a surprise appearance by Hearthstone, also wearing the “West” designation. Are we seeing accounting issues or other problems with the Chinese government in that? Strange times. 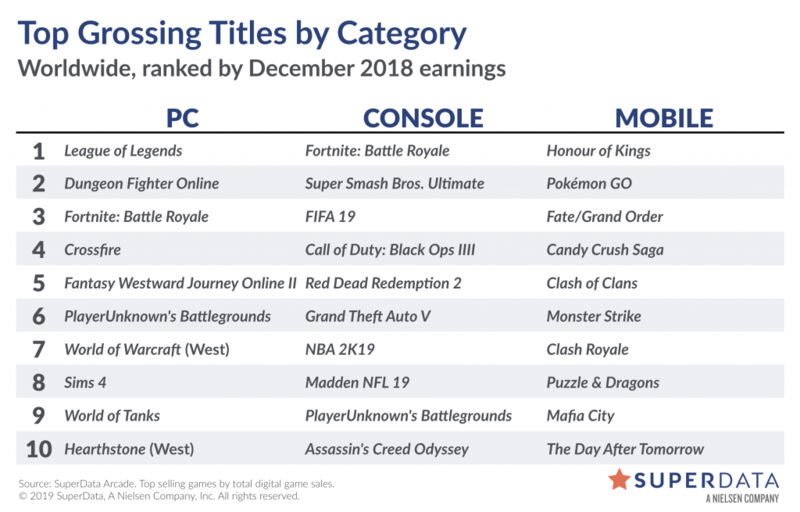 On the Console column Fortnite grabbed the top spot, followed by Nintendo’s release of Super Smash Bros. Ultimate for the Switch. Red Dead Redemption 2 fell from first to fifth, but that still seems like a strong performance for the title. And then the granddaddy of the list, Grand Theft Auto V, climbed up from ninth to six for December. It just keeps on going. Then at the Mobile end of the chart Honour of Kings grabbed back the top spot from Pokemon Go, which fell to second, while the six year old Candy Crush Saga proved its staying power once again by holding onto the third spot. NPD’s U.S. top 10 games list, ranked by dollar sales, includes full-game digital sales (from participating publishers) as well as sales for physical formats sold at retail and online across console, PC and portable platforms. While I cannot find it written out anywhere, I suspect that it the numbers may be US and Canada only as well. Again, if you compare it against SuperData’s 2018 list, which I posted on Tuesday, that is… different. And the list formats are even similar, as EEDAR’s list seems to line up with SuperData’s Premium Games list, which included both PC and console. A few items overlap, but EEDAR again misses completely on things like PUBG and GTA V because of digital sales. Amusingly, further down in EEDAR’s report they talk about social media impression data, and that is dominated by games missing from their chart, specifically Fortnite, League of Legends, CS:GO, DOTA 2, and PUBG. Go figure! Worldwide digital spending declines 2% to $9.0 billion. December’s weakness came primarily from Premium PC, which fell 21% due to an unfavorable comparison against PUBG and CS:GO last year, as well as another single-digit drop off in mobile. This more than offset a 12% rise in console, where Fortnite drove a 209% increase in the free-to-play segment. PLAYERUNKNOWN’s Battlegrounds and Fortnite end the year on a high note. Fortnite had its highest grossing month to date, while PUBG sold 2.75 million units across console and PC. Super Smash Bros Ultimate is December’s best selling console game. We estimate that Smash Bros Ultimate sold 2.49 million digital console units, making it far and away the best digital console launch on the Switch so far. Sims 4 benefits from end-of-year promotions. A significant price cut led to a surge in new unit sales on both console and PC. However, DLC revenue on PC declined year-over-year by 10%. Battlefield V falls short during the holidays. EA’s shooter missed out on the top 10 console list this month after selling significantly less than competing shooter titles. Counter Strike: Global Offensive finds early success as a free-to-play title. CS:GO hit a new MAU high point for the franchise in its second month as a F2P title. We estimate the free version generated roughly $49 million between November and December. I generally do not comment on the other items from SuperData’s notes, but EEDAR has a different look at December. Led by the record-breaking performance of Super Smash Bros. Ultimate and Nintendo Switch, tracked December sales reached $3.4B with growth of 2% when compared to a year ago. Nintendo Switch also finishes the year as the best-selling hardware platform, while Red Dead Redemption 2 is the best-selling game of the year. So SuperData, measuring digital only, says December was down while EEDAR, measuring mostly physical sales, says December was up, though the EEDAR number, $3.4 billion, was overall much smaller that SuperData’s $9 billion number. Anyway, I’ll include EEDAR data as a comparison going forward if I can, though they are not as regular as SuperData, which is pretty consistent about dropping around the last week of the month. This entry was posted in entertainment, SuperData Research, World of Tanks, World of Warcraft and tagged EEDAR, Fortnite, League of Legends, PlayerUnknowns Battleground on January 24, 2019 by Wilhelm Arcturus.